Students at Eleva-Strum "Visit" the Ocean! Middle-school and High School students in the Eleva-Strum School District are visiting the ocean without leaving west-central Wisconsin. 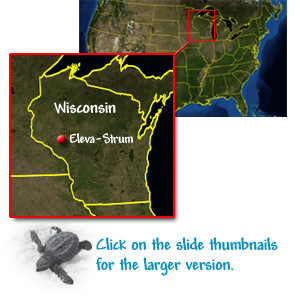 The Eleva-Strum school district is located in Strum, Wisconsin about 90 miles east of Minneapolis/St. Paul, Minnesota. The approximately 300 total middle school and high school students are together in one central building located conveniently between the villages of Eleva (population about 500) and Strum (population about 1000). The student population is predominantly white (97%) and most students are from a rural/agricultural background. Up until this point, the science curriculum at Eleva-Strum has included very little about the oceans. When questioned about the direct impact of oceans on their lives, many students responded that they felt that oceans were important but had little direct affect on them. After all, they are about as far from any ocean as can be. While some students have seen the ocean while on vacation with their family to Florida, for most of the students this is their first experience with oceans. 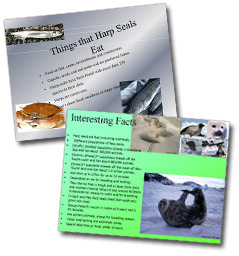 While participating in lessons from the Signals of Spring - ACES program, students in grades 7 to 11 have been learning first hand and on-line about the oceans and its animals. Only a relatively small number of schools across the nation have been able to participate in this unique program and what makes the Eleva-Strum Experience even more unique is that there are two teachers involved. Between the two of these teachers, Traci Marsolek and Martin Walter, all Eleva-Strum students in grades 7 through 10 and many from grade 11 are being exposed in some way to lessons directly related to the oceans and its animals. These two teachers were able to coordinate the application of the ACES program to the science curriculum at Eleva-Strum very easily since they are the only two science teachers at the middle-high school level in the district! Mr. Walter commented that he was even able to have some impact on some of his 12th grade students who, although they did not participate in any direct lessons, were exposed to all the projects, posters, maps and timelines displayed around the room. The comments made and the questions asked by these 12th grade students indicated to Mr. Walter that they were learning from this experience. Students have been excited to be able to not only study about the ocean and its creatures, but also to be able to track actual animals in real time. 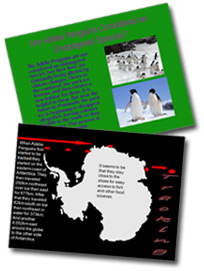 This aspect of animal study made the experience more personal and interesting for the students. Mr. Walter observed that many students took personal ownership of their projects and presentations as if they were reporting about their own pet! 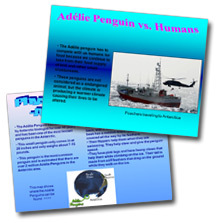 Through a variety of methods, including timelines, posters, lab activities, dioramas, scientist web-casts, power-point presentations and use of on-line interactive programs, students have changed their perspective about the ocean and its animals. By being able to "visit" the ocean through interactive programs that track real animals (with real names), students have had an experience that they will remember. The impact of the Signals of Spring - ACES program has been significant. 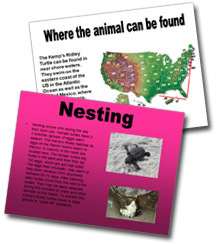 Students have commented that they were fascinated by the ability to track animals. They were astounded by how far (and how deep) many animals traveled and were impressed by the knowledge of the forces that seemed to motivate the movements of these animals. Some students, originally convinced that the ocean was remote and insignificant in their lives, discovered a fascination with the study of the ocean and for perhaps the first time began considering how they might become more involved with the oceans in the future. Finally and perhaps most importantly students were made aware of the fact that humans everywhere (including a place as far away as Eleva-Strum) have a significant (and often harmful effect) on the ocean and its creatures and that the oceans have a profound effect on them.